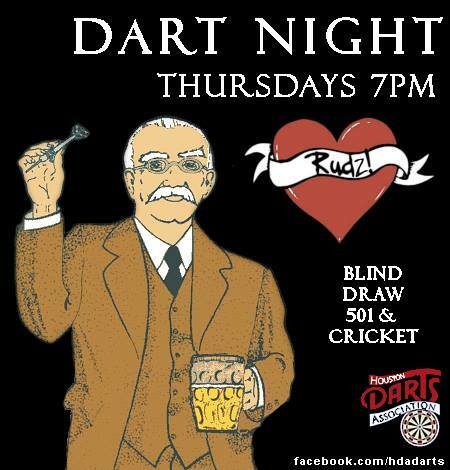 Every Thursday, Houston Darts Association and Rudyard's hosts a Blind Draw Doubles tournament with registration starting at 7:00pm and first throw at 7:30pm. Cash prizes are handed out to the top finishers and half of the tournament pot is graciously matched by Rudyard's to juice up stakes. The BBD tournament will include a best of three format, starting with 501 and Cricket, and team member's randomly matched before the tournament starts. Entry fee's will be determined at the start of the tournament but are generally $5 with optional buy-in's for a mystery out. If there are enough interested following the BBD tournament we will follow up with a singles tournament of similar fashion.